From inspirational ballads to up-tempo rock styles, these are the hits to play in 2012 More than 100 pages of piano/vocal/guitar sheet music capture the year's most popular songs. Titles: All This Time (Britt Nicole) * Blessings (Laura Story) * Busted Heart (Hold on to Me) (For King and Country) * Carry Me to the Cross (Kutless) * Christ Is Risen (Matt Maher) * Courageous (Casting Crowns) * Hold Me (Jamie Grace featuring TobyMac) * How Great Is Our God (Chris Tomlin) * I'm With You (Ruth & Naomi) (Nichole Nordeman and Amy Grant) * Learning to Be the Light (NewWorldSon) * Let It Start with Me (No Other Name) * Strong Enough (Matthew West) * Waiting for Tomorrow (Mandisa) * The Way (Jeremy Camp) * We Are (Kari Jobe) * What a Savior (Laura Story). 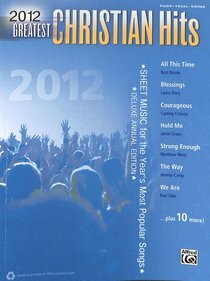 About "2012 Greatest Christian Hits (Music Book) (Piano/vocal/guitar)"